The first stage is simply to get going and develop a base of members and cricket players, and for this a dedicated ground is not essential. A great way to get started is with tapeball cricket – a taped or heavy tennis ball, played on any hard surface. Cricket in Newfoundland started off with tapeball on tarmac basketball courts in a public park, bowling from one end only, and only scoring runs in front of the wicket. Tapeball is played in parking lots, on artificial soccer pitches or indoors in gyms. Protective equipment isn’t required, so you can be off and running quickly. But all cricketers want to play proper, hard-ball cricket, and for this the appropriate field is required. A starting club is not going to have the resources to buy its own field, so initially needs to work with other organizations. The most likely partner is the local municipality. The parks/ recreation departments generally will be interested in developing new sports and should be your first call. It helps if you can approach them with potential spaces already identified. The ideal configuration is an oval shaped playing area that measures at least 140 m by 120 m, preferably flat and with a high quality grass cover. Most public spaces earmarked for recreational use do not fit this model. There may be opportunities however to look at existing recreational facilities that can be adapted for more than one sport. If there are two soccer pitches at the same level side by side, then a pitch can be placed between them, giving a playing area of reasonable dimensions- although scheduling can be a challenge. A baseball or softball diamond without a home run fence also offers possibilities for cricket- a wicket installed in the outfield may allow both games to be played (although not simultaneously). Other public spaces can be considered but safety is an important issue, and should be considered in any proposal. Google Earth/ Maps can help in identifying potential spaces within your community. In the short term, consider using spaces of less than ideal size and dimensions- some clubs have played on soccer sized artificial fields for instance. There also needs to be a common understanding of field maintenance. Cricket almost invariably requires grass cut much shorter than most parks managers prefer. Requesting grass is cut prior to games on the weekend can make for much better playing conditions. Having access to changing rooms is a bonus, as well as access to space to store matting or artificial pitches and maintenance supplies. Once you have a space identified then the critical piece of the puzzle is the pitch. If you are on public land, you will need to work with the municipality in order to get permission to put in a wicket, and there may be opportunities for sharing cost. Raising funds is a critical first step- obtaining a good cricket wicket is not cheap. There are a number of alternatives that can be considered. Developing a good turf wicket is challenging in the best of conditions, and in the Canadian climate with a short growing season, and months of sub-freezing temperatures even more difficult. It is however possible. Anyone contemplating developing a turf wicket needs to plan for constant maintenance, and lots of equipment- at minimum a motorized roller, and the appropriate lawn mower, ideally covers, water supply and hoses, sprinklers and much more. A good turf pitch is the ideal surface for cricket- but a poor turf wicket is not only difficult to play on, but also dangerous. The ability to play a game is also highly weather dependent. In practice, if you are going to try and start a cricket club, you should be looking at an artificial wicket. In cricket playing countries there are a number of companies who will install artificial pitches – the challenge then is purely financial. 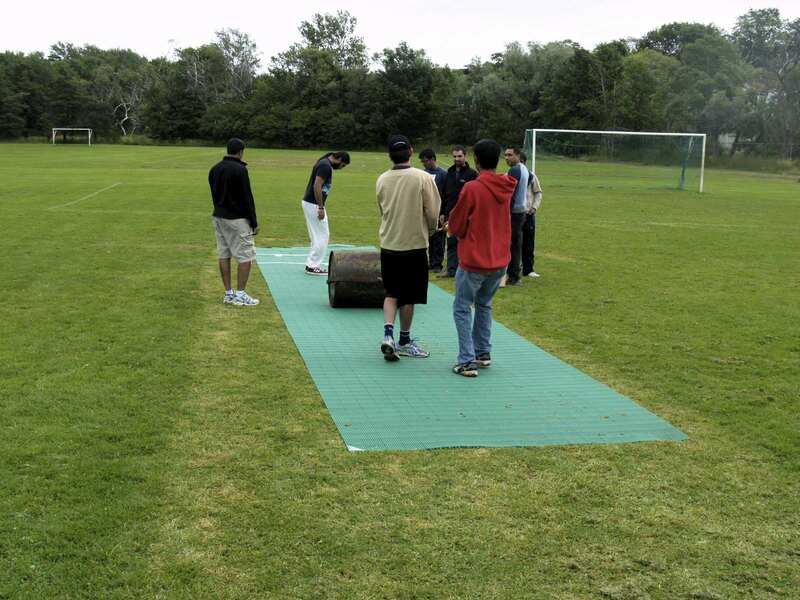 In Canada, developing an artificial wicket requires the club itself to plan and supervise the pitch development. There are a number of options that can be considered. The Flicx pitch is probably the easiest way for a club to get up and running. It consists of hard plastic tiles locked together to form a playing surface, and is designed to be laid down on almost any surface. They are not cheap- a full length pitch will cost upwards of $5000, and they are big and heavy, so expensive to ship. Flicx pitches are one of the few options where a permanent wicket cannot be installed- in a multiuse facility for instance. They can be laid down on a soccer pitch or similar surface just for the period playing cricket, then lifted and stored so other users can access the area. Nottsports also offer a surface specifically designed to be laid down over artificial turf but can also be laid over grass or concrete- this costs around $7000. Matting can also be laid down directly over grass but requires extensive preparation of the underlying surface to be playable. Do not require a specialized sub-surface- can be laid on grass, concrete, tarmac etc. Bounce- the Flicx pitch tends to be fast and skiddy, and unless placed on a hard surface there is little bounce. There’s virtually no movement off the seam, and spinners rarely can get any turn; the Nottsport surface is reputed to be better. Slippery- after rain, the plastic surface is extremely slippery, and not safe for play unless dried (Flicx have a new version that claims to have a non-slip surface, plus better bounce, and help for spinners). Nottsport surface also is not affected in the same way. When laying on a grass surface, the flatter and harder the surface the better. At minimum the grass should be cut as short as possible, and ideally rolled with as heavy a roller as can be obtained. If the pitch can be left in place, then filling in any hollows with soil prior to laying, and then lightly rolling the pitch in place can help. If left in place grass will grow through a Flicx pitch and will need to be trimmed with a mower or strimmer regularly. The pitch cannot be permanently installed on grass- grass will grow and matt unevenly resulting in an uneven and unpredictable bounce. Lifting a pitch after it has been in place too long is very difficult, and may damage the pitch, so even if the pitch is to be in place over the summer it is a good idea to lift it, roll and replace every few weeks. If laid on concrete, the bounce will be better but still low, and the pitch will be fast. Installation of a shock pad underneath the wicket may improve the surface, and there’s a suggestion that laying over half inch thick polystyrene/ styrofoam insulation sheets can improve the bounce on grass or concrete. If a club is able to install a permanent pitch there are a number of options to be considered. A permanent wicket consists of a base and a top surface. The base can be of concrete, crushed stone or clay. Concrete: a concrete slab as the base for the pitch has one major advantage- once installed, it requires almost no maintenance. The major disadvantage is that no matter what top surface is used, the pitch likely to be very fast, and the bounce high – sometimes dangerously so. A concrete slab can be installed largely by volunteer labour, but also most municipalities would have the expertise and ability to do this. The alternative is a base of crushed/ stone/ gravel or clay. Cricketknowhow states:- “Wickets incorporating a hard porous stone (dynamic) base will have playing characteristics most closely resembling a natural grass wicket. The base will respond to rolling by becoming quicker due to increased compaction of the base stone, so you have a degree of adjustment to best suit your requirements. The pace will also vary according to ground conditions as would a natural turf wicket as moisture in the base will result in slower pace and less bounce. This type of wicket would most typically be found at cricket clubs or private schools where ground staff and suitable equipment are on hand to carry out regular rolling and other necessary maintenance. If this is not carried out, the base can become uneven leading to poor or unpredictable bounce.” (http://www.cricketknowhow.co.uk/choosing-cricket-wickets/). plus the costs of a playing surface. Rental of a heavy roller also needs to be considered. Jute or coconut; a matting surface can be purchased in Canada for around $1000 (Montreal Cricket Store offers a full mat for $1150, Dreamcricket for US$850). This can be laid over concrete, crushed stone, clay or in some circumstances, grass. The advantages of matting are cost and, if laid on the right surface, it provides an excellent surface, with even moderately high bounce, and some help for seamers and spinners. The main disadvantage is that it needs to be re-laid for every game. The matting stretches with time, and should be protected from rain. It will wear but if properly cared for will last several seasons. Matting laid directly on concrete will result in a fast pitch and high bounce- less than ideal for high level cricket. It is best laid on a prepared stone or clay base, and then gives an excellent surface. Laying directly on grass requires substantial work to be done before hand, and likely works best in a dry climate. A mat needs to be properly laid and stretched on any surface- Greg Widdicombe provides good advice on how to do this. There are a number of artificial surfaces available that aim to emulate natural grass. In cricket playing countries installation is normally done by the supplying company but it can be done by non professionals. The simplest method is direct installation of artificial turf on a concrete pad. This involves simply gluing the surface to the concrete. In order to mitigate the high bounce from concrete, a surface that incorporates a shock pad is important. This underlies the “grass” top and consists of a foam pad that softens the surface. “On a woven (known as Wilton) playing surface the polypropylene fibres making up the pile are “locked” into the backing (warp and weft fibres) by the weaving process making the product very strong and stable. The product is fully porous. Although tufted cricket surfaces look superficially similar, the pile fibres are punched through a prefabricated cloth backing and then “glued” in place by an adhesive applied to the reverse side of the backing cloth. Tufted surfaces are generally much lighter grade compared to woven surfaces. The glued in pile can wear or be pulled out of the backing quite quickly in high wear areas such as the batting and bowling creases. The adhesive holding the tufts seals the backing cloth so these products are only porous through factory made drainage holes punched at regular intervals. A woven surface will likely cost twice as much as a tufted surface, but likely will last much longer. A tufted mat on a foam backing can be obtained for around $1200-1400, plus shipping from DreamCricket or other suppliers. Installation on a crushed stone surface can be challenging for non-specialists- it may be best to seek advice from the supplier of the turf. The best combination for most clubs if they can obtain a permanent facility is likely a crushed stone/ clay/ shale base, plus a matting wicket. This gives an excellent playing surface that will require some maintenance, plus installation and removal of the mat for games. A low maintenance alternative is a concrete slab with a plastic surface glued to it; this can be constructed without specialist input and requires little maintenance. Even with a shock pad included, however the bounce will be high and fast, and without a shock pad, bounce can be hazardous. Without a dedicated facility the alternatives are either a flicx pitch (low bounce, slippery in the wet), or matting over grass (heavy roller essential, poor bounce in wet conditions).